I have always been a sucker for homemade goods! The fact that someone would think about me in advance to get creative with presents is simply wonderful! But I come from a long history of very crafty people, so I guess it's in my blood. This Christmas, in addition to the gifts I picked out for friends and family, I wanted to add my own element of homemade. And since I know my friends love a good chai tea, I decided to make a big batch of dry chai mix, and can it in individual jars. Just pop a piece of fabric between the lid, tie a note with twine around the top and call it a day! So simple, yet cute and useful! I love how it turned out and am now brainstorming some other great things that would make good gifts for next year! That is, of course, in addition to the homemade cookies, fudge and peppermint bark that I also give away every year! What about you? 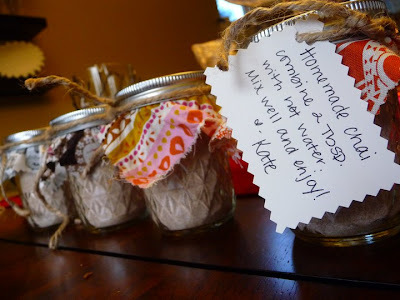 What are some lovely homemade gifts you've done or received?